Did you ever see a smartphone on display somewhere and tell yourself that you'd do anything to have that phone? Well, if your dream handset is the Nokia Lumia 925, now is your chance to make that dream come true. Finnish manufacturer Nokia is giving away five new Nokia Lumia 925 handsets for the five best answers to the question "What would you do for a Nokia Lumia 925?" 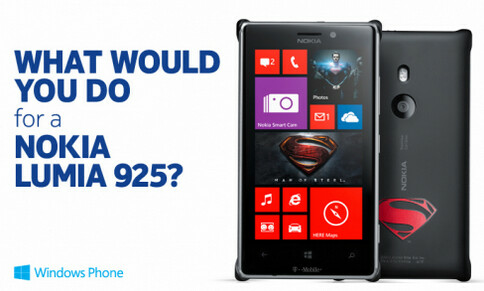 What would you do for a Nokia Lumia 925? Click on the sourcelink to see the entry page. You will need to answer the usual personal information (name, address, number of hammer toes etc.) and then tell Nokia what you would do for a Klondike bar Nokia Lumia 925. This is another camera-centric high end Windows Phone model with a 8.7MP rear camera and an f/2.0 aperture that will allow for some great photography in low-light conditions. The contest has already started and you have until 11:59PM PDT on July 5th to submit your entry. One entry per person is allowed, although you will be allowed an additional submission for each Facebook friend who enters the contest. Five winners will be selected on or around July 7th. 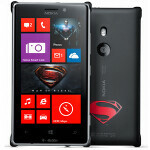 The winners will each receive a brand new Nokia Lumia 925. The contest is available only to those living in the U.S., where the phone will eventually launch via T-Mobile. So just what would you do for a Nokia Lumia 925? You dislike that??? I dislike this "The contest is available only to those living in the U.S.". Actually Spain and the USA are quite at the end of the list. Italy isn't at the top of the list either. I would sell it and get a better phone. Are you serious? The specs on this phone are worse than the Galaxy s3. This is a budget mid end phone not a flagship. The only reason to buy this would if your to lazy to carry around a real camera and don't mind having a phone with cancer installed on it. If you want a good camera stop overhyping lumia phones all they are better at is lowlight over the S4/HTC One. You can get a really nice DLSR for the same price. Have you noticed, that Lumias run Windows phone and not android? And that WP runs as fast or faster than GS4, even if it has so high end specs? You have to realize, that different operating systems need different amount of power. WP is one of those that don't need so much. Only downside is that it doesn't have so many apps. But it has most of them and more is coming! Another stupidity from an android/samsung fanboy. I just watched on youtube how to fixed lag on galaxy s4. Hahaha dude I have a wp8 look at my fricking phones....and I have said this argument on a post yesterday somewhere...OK...I have a wp and I have a android most of the things I do On my android eg. customization and tweaking internals I cannot do on wp....and this is the thing I struggle with the most....yes its a beautiful OS and looks superb...I mean I like the metro ui....its really nice....but looks aren't everything...don't get me wrong the functionality is there but there is no where near as much options on a wp than on android...it almost feels as if iT was designed for first time users...granted it does some things better than android eg, you can uninstall directly from an app...but the thing is for a heavy user like me it just feels like its not advanced and seems as if it still has a way to go to be classes as on par with android...just my honest opinion. Was that un fanboyish enough for you? Did you ever go to school innit? im not saying that wp is better than android, Wp and android are meant for two different type of people. What im saying from my reply to shatter is that you cant compare the two phones from its specs only. I have a nexus 7, my brother has a galaxy note 2 and i know android needs a lot of processing power to maintain its fluidity. I also have a 920 which has only 2cores and wp is smart enough to utilize its processor. hmm your really are dense, im sure ive seen comments like yours before. first of having a phone on your profile proves nothing i can put every phone out on mine doesnt mean i own them. second so now you have a HTC wp device yet your comments on HTC articles are always full of critism while you praise samsung. seen it your comments speak louder then your bs about owning a wp device haha awww kid so many have tried throwing the fanboy line at me with little succes as i dont stand in line for any company i get whatever i like. ''so if you come to the argument I'm a fanboy'' makes no sense kid, should be ive come to the conclusion your a fanboy which you are. as for the showing off, you like you fellow robot fanboys love attacking apple users for what you do yourself. your just another carbon copy of a fanboy so stop the hiding behind your bs and just state it outright.. WHoyton1- pretends to own a HTC wp device yet slates both wp and HTC. only defends samsung to the point of replying to all who joke about cheap plastic etc yet says nothing if there's a joke at apples expense. and always bigs up android shoving it into all articles when the fact that android isnt for everyone and not everyone wants some fanboys shoving it down there throat all the time you hold android up as the best, so why not go on an android centric site and be happy in your green garden.